SIGN UP! - Do make sure you are signed up to receive JPFO email alerts. We have been gratified to receive a substantial number of emails with moving comments and reminiscences, which are very much appreciated. From many of these we have now generated a "Guest Book page" so that they can be shared and appreciated. As always, thank you for all your support. For those who may wish to bookmark the JPFO Aaron Zelman Tribute Page, currently our front page, please note the following permanent page which will be available even when at a later time the homepage resumes as our front page. Get an aggressive defense of your rights, team up with JPFO today! Hover on scroll to stop. Listen to JPFO's Talkin' to America Interview, and discover the "Ten Commandments of Self Defense" (2 CD set). Read the JPFO Analysis of the Supreme Court's decision on McDonald vs. Chicago. JPFO is offering a great discount on "Innocents Betrayed" and "The Gang" films. Buy a 6 quantity and copies are $12 each, total $72. Buy a 12 quantity and copies are just $10 each, total $120. Shipping included to USA. It occurs to us that a few people may like to consider mixing their order and so to accommodate that we have added a Special Order Page where a choice can be made and detailed in the cart comments section. It has been found that "Adblock Plus" may have to be disabled, if you use it, to permit a successful entry and submission. Our provider currently is aweber.com - so you will receive emails from them after sign up. First will be a request for confirmation so they know they will not be spamming you, and second, do make sure you put aweber.com and jpfo.org on your spam filter 'allowed' list (white list) or you may not receive the alerts. Much has been done to try and upgrade the site (including recent further site wide adjustments), despite over 2,500 pages, many of which are still old style and may well have dead links. A total rebuild is not economically possible but we have tried to add useful pages and update many others which are the most pertinent. The site was started as simple html and that is the way it has to remain but, with more use of styling and limited scripting it is hoped appearance is found better than before. Effort has also been put in to trying to enhance navigation so that important pages can be more easily found - and to this end the top menu links bar has been expanded, plus a tabulated set of links accessible both on this page and elsewhere. This film exposes the racist history of American gun control laws. Every person who supports gun control laws must be shown this film or gun ownership will cease to exist in America. Go to our download page now. Comments on "No Guns for Negroes"
NEW - Read a very relevant article - "The Racist Roots of Gun Control" by Clayton E. Cramer. 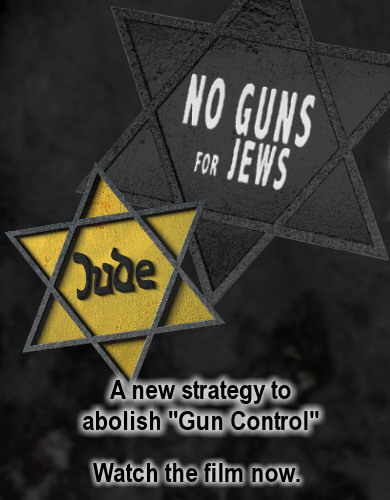 "No Guns for Negroes" is another stark demonstration that the real meaning of contemporary "gun control" is "people control"-- always for vicious reasons and usually with deadly results. If we keep in mind the principle "what is past is prologue", "No Guns for Negroes" can teach us what we all have to fear from "gun control", and why all of us should work together to rid our country of this scourge -- immediately, if not sooner. Edwin Vieira. No Guns for Negroes dramatically portrays a little-known part of America's history. This is a powerful answer to "Why do we need guns in civilian hands today?" Larry Pratt, GOA. JPFO has put out some great 2nd Amendment documentaries that really, really ought to be shown in every school. And, they've hit yet another home-run with their latest film, showing that gun control is undeniably racist. The film is called "No Guns For Negroe's", and it's all about how gun control in America began as an attempt to disarm the free blacks following the civil war. It's a must-watch for you and everyone you know. Tim Schmidt, USCCA. Ralph W. Conner, Chairman of the Congress of Racial Equality (CORE)-Chicago, and Donna Major, Boston Field Coordinator for Second Amendment Sisters, are our guides through this 20-minute video. I urge you to stop what you're doing, right now, and go watch it. Share the link with everyone in your sphere of influence -- friends, relatives, fellow gun owners -- and especially with people who may actually believe that all motives for "gun control" are pure and benign. David Codrea. The best educational video ever made to save The Second Amendment. Go to our download page now. G.Gordon Liddy comments - "..... it counters the arguments of the gun controllers, the misinterpretation of the second amendment – and it does so very well, clearly and concisely. Share it with your friends – it is important"
buying products from Shop as You Give. Check out their weekly specials. This chart comes from the book Death by "Gun Control"
Learn more, view "Innocents Betrayed", a documentary film that shows the use and results of "Gun Control" in the eight major genocides during the last 100 years. check out the requirements for a useful report on this page. Use the JPFO Help Page for useful tips.